Many visitors to Monaco don't see this side of the Principality. 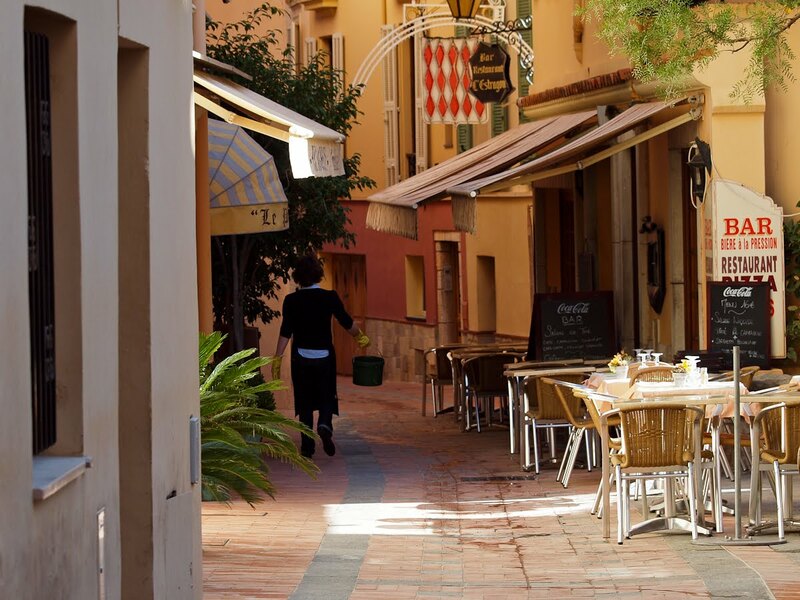 They see the glitz and the glamour of Port Hercule and the Casino and miss these adorable little streets. This is a bar/restaurant on le rocher where preparations for lunch are underway. I can understand why people move to the area. such a cosy lane!I would love to have a lunch there! This is the area where I have had the best Banana Split ever. Of course the athmosphere influenced a lot! Lovely shot - I could just pull up a chair and order a cafe creme. Looks like a fantastic place for lunch! You'd have to go early to get one of those outside tables! Great shot! These wonderful little streets are why I love Monte Carlo. I'm wishing I could have lunch there today. Must see I prefer by far this side! I agree with Rob - this is the side of France which appeals to my sensibility, too. Glitz and glamour never cuts it with me. I prefer to visit the less touristy areas of a place. This looks just the sort of thing I like. This isn't a criticism Jilly, but personally I would have taken it at a different angle, maybe closer to where the tables are, so you see more of the bend in the road, the coloured walls and to eliminate the distracting grey building on the left. Warm and inviting. I could imagine this street in many towns in Provence and Tuscany. For some reason it reminds me of Sienna. More than happy to have photography advice, Gailsman. It's always so helpful. In fact I took this very quickly, as I wanted to get the restaurant worker in the shot. Later I took a couple more shots from different angles but as none had the figure in it, I went for this. Also had I concentrated on your suggestion of seeing more of the bend in the road, I would have lost the light. It was the light across those tables as well as the figure that attracted me. Beyond is dark... that's how those little streets are on le rocher. The photo is already cropped fairly heavily but I could crop a little off the left but then it changes the proportions of the photo. Jilly, I do like that you caught the women in the photo. It's something I neglect - including people in my photos. It is something I need to work on more. I, also prefer the less touristy areas of anywhere. This street is charming.